Azure Data Factory is a hybrid data integration service offering a code-free experience. Extract data from heterogenous data sources, transform it at cloud scale with the Mapping Data Flow feature (now in preview), publish it to any analytics engine or business intelligence tool, and monitor and manage your data pipelines. Work with the data wherever it lives, in the cloud or on-premises, with enterprise-grade security. Accelerate your data integration projects by taking advantage of more than 80 available data source connectors. Use the graphical user interface to build, monitor and manage your data pipelines. Transform raw data into finished, shaped data ready for consumption by business intelligence tools or custom applications. Easily lift your SQL Server Integration Services (SSIS) packages to Azure, and let Data Factory manage your resources to help you increase productivity and lower your costs. Build automated data integration solutions with a visual drag-and-drop UI. Move data seamlessly from over 80 sources without writing code. Build data integration pipelines that span on-premises and cloud. Easily lift your SQL Server Integration Services (SSIS) packages to Azure. Data movement using Azure Data Factory has been certified by HIPAA/HITECH, ISO/IEC 27001, ISO/IEC 27018 and CSA STAR. Build serverless, cloud-based data integration with no infrastructure to manage. Take advantage of elastic capabilities to scale out with your customer growth. Move data from on-premises and cloud sources to a centralised data store in the cloud for further analysis by using the Copy Data activity in a data pipeline. Invoke pipelines with on-demand and trigger-based scheduling. Visually monitor pipeline activity with logging and pipeline history, and track error sources. Embrace simplicity. Get data pipelines up and running quickly. Use the visual drag-and-drop interface to build, deploy, transform and manage your data. Easily lift your SSIS packages to Azure while retaining the investments made in your on-premises SSIS. Get high availability and scalability, and reduce your costs using fully managed Azure services. Data Factory is much more than a way to move data from one place to another. Visually construct workflows to orchestrate data integration and data transformation processes at scale. Work the way you like. Use the visual interface or write your own code in Python, .NET or ARM to build pipelines. Choose from a wide range of processing services and put them into managed data pipelines to use the best tool for the job, or insert custom code as a processing step in any pipeline. Data Factory offers more than 80 natively supported connectors, including Azure data services, on-premises data sources, Amazon S3 and Redshift, and Google BigQuery. The code-free cloud environment lets you focus on building business logic and data transforms, scaling for you as needed. 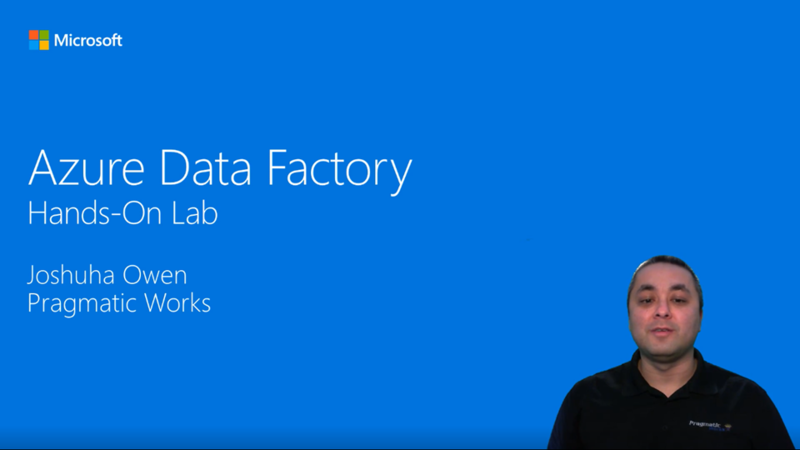 What can you do with Azure Data Factory? Integrate structured and unstructured data from on-premises and cloud data sources, transform data in big data and data warehouse engines, then load your data marts into Azure SQL Data Warehouse for business analytics. Build custom data-driven cloud applications that embed a data integration experience with global scale. Lift SSIS packages to Azure. Schedule and monitor your Data Factory pipelines. Read this e-book to learn how to lift your SQL Server Integration Services packages to Azure with Data Factory. Lift your SQL Server Integration Services packages to Azure.